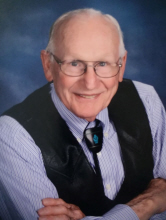 Carroll Vaughn Pinson, 83, went home to be with the Lord February 1, 2019. He was born on January 22, 1936 in Mineral Wells, TX. Carroll served four years as a Marine electrician in Okinawa. Upon completion of his military service commitment, Carroll married Bernice Cox in 1962. He went on to finish his electrician apprenticeship, and then Carroll and Bernice started their family in New River, AZ. They had two children, Neal and Leslie. After Carroll retired as an electrician, Bernice and Carroll relocated to Prescott, AZ, to build their dream retirement home, and enjoy their four beloved grandchildren. Carroll is survived by his wife, Bernice; his children Neal (Tamra) Pinson and Leslie (Koen) Pinson Bosman; grandchildren Cody and Mykayla Pinson, and Melanie and Thijs Bosman; five siblings; and several nieces and nephews. In lieu of flowers, the family requests donations to the American Cancer Society or to your preferred mission organization. To send flowers or a remembrance gift to the family of Carroll Vaughn Pinson, please visit our Tribute Store. "Email Address" would like to share the life celebration of Carroll Vaughn Pinson. Click on the "link" to go to share a favorite memory or leave a condolence message for the family.